You can take any* Fan-Tastic Vent or Create-A-Breeze and upgrade it to be a Model 6600R. The installation is easy, just a few easy steps. Never disturbs the factory waterproof seal! Simply remove the old control panel, screw in the new lift arm, clean knockout in base, install the new 6600R upgrade control panel and enjoy the wireless controller from the comfort of your chair. Technology evolution, our manufacturing experience and meeting consumer needs and desires for 21 years are the motivation behind our newest ventilator, the 6600R/417. For consumers tall or short; with old or new Towables or Motorized RVs, this patent pending air exchange system makes operation as simple as sitting in your easy chair and pushing a button. Our Radio Frequency Handheld Remote has you activating the fan and raising the dome by pressing the mode pad. With the automatic mode, you select your comfort setting and the blades will automatically turn on, off, increase or decrease speed to maintain your temperature choice. Manual mode allows you to select off or one of 14 fan blade speeds. The 6600R vent is equipped with our reversible airflow switch (In or Out air flow), and Rain Sensor. The built in rain sensor closes the dome and turns off the fan blade when the sensor becomes wet; the dome reopens when the sensor dries. 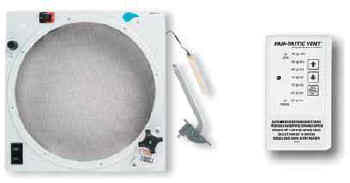 A rain sensor shut off switch and a back up manual dome open/close knob are also provided. • Optional insulated dome. Please call for information.